Port Macquarie is a coastal town in the local government area of Port Macquarie-Hastings. It is located on the Mid North Coast of New South Wales, Australia, about 390 km (242 mi) north of Sydney, and 570 km (354 mi) south of Brisbane. The town is located on the Tasman Sea coast, at the mouth of the Hastings River, and at the eastern end of the Oxley Highway (B56). The town with its suburbs had a population of 45,341 in June 2015. The site of Port Macquarie was first visited by Europeans in 1818 when John Oxley reached the Pacific Ocean from the interior, after his journey to explore inland New South Wales. He named the location after the Governor of New South Wales, Lachlan Macquarie. In 1821, Port Macquarie was founded as a penal settlement, replacing Newcastle as the destination for convicts who had committed secondary crimes in New South Wales. Newcastle, which had fulfilled this role for the previous two decades, had lost the features required for a place for dumping irredeemable criminals, that being isolation, which was lost as the Hunter Region was opened up to farmers, and large amounts of hard labour, which had diminished as the cedar in the area ran out and the settlement grew in size. Port Macquarie, however, with its thick bush, tough terrain and local aborigines that were keen to return escaping prisoners in return for tobacco and blankets, provided large amounts of both isolation and hard labour to keep the criminals in control. Under its first commandant, Francis Allman, who was fond of flogging, the settlement became a hell, where the convicts had limited liberties, especially in regard to being in possession of letters and writing papers, which could get a convict up to 100 lashes. Because of the lack of liberties of the settlement, Governor Ralph Darling quickly sent there many 'specials' or literate convicts with a decent education who had voiced negative views about him. Later on in the settlement's history, in the 1830s, disabled convicts started to arrive. One-armed men would be grouped together and required to break stones, men with wooden legs would become delivery men, and the blind would often be given tasks during the night which they performed more skilfully than those with sight. In 1823 the first sugar cane to be cultivated in Australia was planted there. 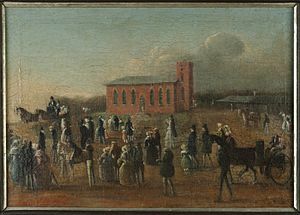 The region was first opened to settlers in 1830 and later on in the decade the penal settlement was closed in favour of a new penal settlement at Moreton Bay. Settlers quickly took advantage of the area's good pastoral land, timber resources and fisheries. St Thomas's Anglican Church is a Georgian building designed by Francis Greenway and built, under the supervision of military engineer Lieutenant T. Owen, by convicts during 1824-1828. This church is among the oldest in Australia and one of the few remaining convict-built churches. Inside there are red cedar box pews that were peculiar to that period in church architecture. The Walker pipe organ is the only one of its type in the southern hemisphere. The castellated tower permits excellent views of the coastline, town and river. This church is now classified by the National Trust of Australia (NSW) and has been registered on the National Estate heritage list. In 1830 Major Archibald Clunes Innes built Lake Innes House which grew over the next decade into a luxurious establishment and attracted many notable visitors. It is now a ruin and is managed by the NSW Parks and Wildlife Service. In 1840 the "Wool Road" from the Northern Tablelands was under construction to enable wool and other produce to be shipped from the port. Port Macquarie was declared a municipality in 1887, but the town never progressed as a port owing to a notorious coastal bar across the mouth of the river. Over 20 shipwrecks occurred in the Tacking Point area before a lighthouse was designed by James Barnet and erected there in 1879 by Shepard and Mortley. Tacking Point Lighthouse is classified by the National Trust of Australia (NSW). The estimated urban population of Port Macquarie was 45,341 as at June 2015, having grown 1.1% on prior year and from 39,783 over the prior decade. Port Macquarie is expected to be the fastest growing place in New South Wales. The town is expected to grow from an estimated 43,655 people in 2009 to 58,888 in 2027. Port Macquarie is a retirement destination, known for its extensive beaches and waterways. The town is also known for its koala population, being the home to the Billabong Zoo (a wildlife park and koala breeding center) and the Koala Preservation Society's Koala Hospital, caring for koalas injured through bushfire, dog attacks and collisions with vehicles. In 2016 the war memorial was relocated from Town Green to its original location at the intersection of Clarence and Horton Streets. The residential suburbs stretch to Lighthouse Beach in the south, Thrumster to the west and to North Shore, on the northern bank of the river. In July 2010, Sovereign Hills began development in the west. Port Macquarie was found to be the least affordable smaller city in Australia by Demographia's 2013 International Housing Affordability Survey. Port Macquarie's central business district contains two shopping centres, a marina, the beginnings of a coastal walk, and many specialty stores. A centrally located arts, conference and entertainment centre includes a visitor-information facility. Bus services link the town with Laurieton, Wauchope, Kempsey, Lake Cathie and Bonny Hills. Transit Hill to the south is crowned by telecommunication towers. The district is the site of two arterial roads which provide a direct link between Lighthouse Beach and Port Macquarie CBD. The main intersection of Pacific and Kennedy Drive is situated midway up Transit Hill. It is an area of high-priced real estate owing to ocean and city views. Transit Hill borders Lighthouse Beach, Dahlsford, Shelly Beach and Waniora. Beaches (in order from north to south) are: North Shore, Town Beach, Oxley Beach, Rocky Beach, Flynns Beach, Nobbys Beach, Shelly Beach, Miners Beach (unofficial clothing-optional) and Lighthouse Beach. Only Town, Flynns and Lighthouse Beaches are manned by Surf Life Saving Clubs. Lighthouse Beach is patrolled at only the northern end. Dogs can be walked off-leash at Lighthouse Beach, south of Watonga Rocks, excluding sections at the northern end and Nobbys Beach. Sea Acres National Park is adjacent to Shelly Beach and contains a Visitor Centre with access controlled rainforest boardwalk. Port Macquarie has a humid subtropical climate, and is widely regarded as one of the most liveable towns in Australia. Port Macquarie Airport (4 km west of town) has regular flights to Sydney with QantasLink (5 times daily) and Virgin Australia (twice daily), and also to Lord Howe Island with QantasLink and Brisbane with Virgin Australia. There is no railway station in Port Macquarie. However, the Port Macquarie CBD and northern suburbs are served by the nearby Wauchope railway station (17 km west of town), and the southern suburbs including satellite towns of Lake Cathie and Laurieton are served by Kendall railway station (30 km southwest). Both stations are on the North Coast Line operated by NSW TrainLink with 3 services daily in each direction towards either Newcastle and Sydney or northwards to Grafton, with travel time to Sydney of approximately 6 hours. There is a railway-operated connecting bus service available from Wauchope railway station to the Port Macquarie CBD. Pacific Highway – Karuah to Bulahdelah section 2 and 3 (Karuah to Bulahdelah section 1 – Completed December 2006). Pacific Highway – Bulahdelah Bypass The Bulahdelah bypass/upgrade fills the only missing Pacific Highway link between Hexham and Port Macquarie after the opening of the Karuah to Bulahdelah section(s) 2 and 3 and the Coopernook to Herons Creek upgrade. Pacific Highway – Coopernook to Herons Creek. The Oxley Highway upgrade, from a 2 lane undivided road to a 4-lane divided carriageway, from Wrights Road to the Pacific Highway. These four projects are all from the AusLink funding on a joint basis from the Commonwealth and the state of NSW making equal financial contributions. Port Macquarie Facts for Kids. Kiddle Encyclopedia.